Dogging Morrissey | News and Features | Style Weekly - Richmond, VA local news, arts, and events. 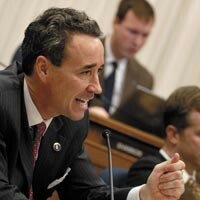 Can roaming dogs allegedly owned by Delegate Joe Morrissey receive legislative immunity? Sometimes a dog&apos;s life ain&apos;t so bad. Take, for instance, the life of a certain black pit-bull mix and its companion pooch allegedly belonging to Delegate Joe Morrissey, D-Henrico. Henrico County Animal Control picked up both dogs Feb. 5 as they roamed the Varina District in the vicinity of a house where their alleged owner allegedly does not live. The day before both dogs&apos; apprehension — picked up for “roaming at-large,” according to Henrico police — the black pit bull mix had been fingered by a passing pest exterminator as a cat killer. Seems it and a neighboring dog — belonging to residents in the 8600 block of Osbourne Turnpike — had tucked into a cat at the same house. The dogs that police allege are Morrissey&apos;s were picked up at the Osbourne Turnpike residence, caught returning to the scene of the previous day&apos;s felicide. Despite being caught on the roaming charge, both the dogs — and Morrissey — may get to share among them what&apos;s left of the unfortunate feline&apos;s nine lives. Because Morrissey is engaged in the business of the state, both he and his pets may enjoy something of a temporary get-out-of-jail-free card. “We&apos;re going to wait until after the General Assembly is over before we press charges,” Henrico Commonwealth&apos;s Attorney Wade Kizer says, citing legislative immunity, which prevents lawmakers from being charged with crimes while the assembly&apos;s in session. The point is to prevent outside parties from obstructing the legislative process. When and if Morrissey is charged — the roaming at-large charge is a misdemeanor, punishable by a $250 fine — this prosecutorial dog may have trouble finding its running legs. Morrissey sprung the dogs from the county pound late Friday, Feb. 6, and Henrico Police Lt. Shawn Sears, the county&apos;s animal protection supervisor, confirms both dogs wore rabies tags paid for by Morrissey. But there remains no confirmation that the dogs are positively Morrissey&apos;s, he says. “We believe they may belong to him,” Sears says, noting that one issue with determining ownership is confused by Morrissey&apos;s official address. The animals both reside on Morrissey&apos;s Varina estate at 8700 Osbourne Turnpike, but as a delegate representing the 74th District, Morrissey officially lives at 605 E. Nine Mile Road. The Osbourne Turnpike house, according to Morrissey and state records, is operated as a group home for mentally challenged adults. “There are a lot of intricacies in these things,” Sears says. A similar issue of ownership came up in an earlier court case involving Morrissey and a previous pack of pit bull mixes, Sears says. Those dogs were less interested in cats. Instead they&apos;d attacked neighbors and visitors to Morrissey&apos;s property, allegedly causing significant bodily injury. The dogs bit at least four people, according to Henrico County police reports, which Style reported in April 2000. “I just don&apos;t have the heart to have any harm come to those dogs,” Morrissey told Style at the time, saying the dogs were not his. He said he paid the dogs&apos; vet bills but that they belonged to his property manager. “They&apos;re licensed to [the property manager], they&apos;re registered to him, and I just happen to love them,” Morrissey said at the time. Correction: A police report incorrectly identified the address where two dogs belonging to Delegate Joe Morrissey were picked up by county animal control officers. The correct address, also in the 8600 block of Osbourne Turnpike, was south of the property identified in a police incident report.